With the wealth of great effects and effect companies that exist today, pedalboard space is at an all-time premium. Fortunately, even with so much product to choose from, technological advances have enabled circuits to become more compact and pedals more, well, mini. So you don’t need to be playing on a stage the size of Madison Square Garden's to have the room to lay all your myriad gadgets down at your feet. Below, Guitar World selects 10 of the best mini-pedals on the market today, from re-imagined versions of classics like the Tube Screamer and Cry Baby to jam-packed boxes like the Mooer Mod Factory. Better yet, in many cases, these smaller offerings also come with a smaller price tag—another reason to collect even more of them for your ‘board. Ibanez’s TS Mini is a downsized version of its iconic Tube Screamer, which since its debut in 1979 has been one of the most recognizable, respected and employed overdrive pedals on the market. True to its name, the Mini measures roughly 1 1/2–inches wide and 3 1/2–inches long. Ibanez pulled out all the stops to create this solidly built, all-analog stompbox in a compact design, while retaining the sonic integrity of its acclaimed TS808 Reissue. To accommodate its diminutive size, it features an internal surface mount JRC4558M chip, which is similar to the beloved JRC4558D chip found in the full-sized TS808 pedal. The TS Mini requires an external nine-volt adapter for power, and also features true-bypass switching and controls for Level, Tone and Overdrive. Performance-wise, the TS Mini sounds so superb you’d be hard pressed to tell the difference between it and its full-sized counterpart in a blindfold test. It works best in front of a tube amp, makes single notes sound fatter and softens your low-end register with warmth and clarity, all while preserving the tonal nature of your amp. Pushing the Overdrive past 12 o’clock adds wicked squeal to pinch harmonics and lets you coax out some righteous musical feedback. All the warmth and punch of Ibanez’s classic TS808 overdrive in a pedal board–friendly size. Pigtronix’s Philosopher's Tone Micro delivers all of the noiseless clean sustain and parallel optical compression of its larger namesake, but in a micro-sized chassis. The mini-pedal boasts volume and sustain controls, as well as a parallel Blend knob that allows users to mix their instrument's original dry tone with the compressed sound effect to their liking. Additionally, a treble control provides up to 6db cut or boost at 2KHz for fine-tuning the frequency response of the effect. The Philosopher's Tone Micro features true-bypass switching and 9V operation, with internal 18V power rails for maximum clean headroom, even when used with hot pickups and line-level signals. With that combination of boost, compression and extra top-end, the pedal has a role to play beyond just a compressor, notably as a tone conditioner/driver that can elevate your sound for solos. The Mod Factory packs an impressive 11 effects—chorus, flanger, phaser, envelope phaser, tremolo, “stutter,” vibrato, Univibe, auto-wah, touch wah and envelope ring—inside its tiny chassis. Furthermore, operation is simple and intuitive: The center white dial chooses from among the pedal's 11 effects. The three smaller knobs are Depth, CTRL 1 and CTRL 2. CTRL 1, depending on which effect is on, can operate Speed or Sensitivity. CTRL 2 acts as either a Tone or Level. The pedal uses a 32-bit DSP chip to create its sounds and works with any 9-volt negative-tip power supply. For a space-saving, cost-cutting option for your pedalboard, the Mod Factory can’t be beat. Dunlop’s Fuzz Face Mini Jimi Hendrix offers a circuit identical to that of Dunlop’s JHF1 Jimi Hendrix Fuzz Face, based on Hendrix’s own Dallas-Arbiter Fuzz Face from 1969–’70 and featuring BC108 silicon transistors. The result is the same smooth and even sustain, harmonic overtones and compressed attack of the original, but in a smaller housing—and with a smaller price tag. The Mini Jimi boasts volume and fuzz controls, true-bypass switching, a laser-bright status LED, AC power jack and easy-access battery door, all of which are presented in the same classic round chassis with the same skip-pad “nose” of the original, albeit at less than one-third the overall size. Best of all, the new pedal expertly reproduces the classic Fuzz Face square-wave distortion—undeniably over-the-top, but still incredibly warm and smooth. The distortion cleans up nicely when the guitar’s volume control is backed down just slightly, allowing players to easily dial in the desired fuzz effect, from just a touch of hair to full-on fuzz assault at will. So you get all the fuzz, while saving pedalboard space and dollars. 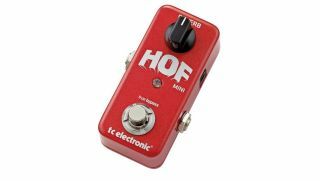 TC Electronic's Hall of Fame Mini is an extremely streamlined box, petite in size and boasting a simple one-knob design that comes preloaded with the company’s hall reverb. But through the use of the TC Electronic’s TonePrint smartphone app, any of the full-sized Hall of Fame settings and artist-programmed TonePrints—covering Spring, Hall, Room, Plate, Cathedral and more styles—can be beamed into the pedal. Furthermore, with the free TonePrint Editor software you can connect the stompbox to your computer and create your own TonePrints by adjusting a wealth of hidden parameters, and even assign which parameter the pedal's single knob controls. Though it looks small from the outside, there’s a wealth of verb options to be found in the Hall of Fame Mini, making it possible to send your sound into the furthest reaches of space—all while saving lots of it on your pedalboard. Red Witch’s Violetta boasts a full 1,000ms of delay time, offering up Brian Setzer-esque rockabilly slapback, dreamy, Gilmour-like ambience and everything in between. Better yet, the digital circuit emulates classic tape echoes, with a gradual decay in top-end, plus warmth and clarity to the repeats. There’s also a modulation circuit that can add anything from a subtle shimmer to full-on acid-trip psychedelia. The mini-knobs provide control over delay time, mix, modulation and repeats. The Violetta also comes with an Expression Pedal jack and a stereo 1/8” to 1/4” adapter for controlling the number of repeats in real time, and the pedal operates with either a 9V power supply or from the internal rechargeable lithium ion battery. What’s more, the Violetta’s looks are striking, from the chrome chassis to the not-just mini, but downright tiny, footprint. Noted pedal guru Robert Keeley is legendary for, among other things, his TS9 Tube Screamer mods, which he’s been doing since the early 2000s. All of those mods, such as increased bass response, a fine-tuned tone control, greater cleans when turned down, and higher gain, were collected in the Red Dirt, along with one important addition—a JFET input buffer for more dynamic sound. Now, the circuit is available in mini-pedal form. The Mini features a large center knob for drive and smaller ones on either side for tone and level. It follows the standard TS configuration. There are four modes of operation—Distortion, Overdrive, Crunch and Amp—and you can change the clipping diodes by taking the bottom plate off and adjusting the DIP switches for either a more compressed sound, a more open tube-amp-like sound or variations in between. The result is a small pedal that offers huge tone and flexibility, everything from super-high gain to bolder, cleaner sounds. One of the most ubiquitous pedals in all of guitardom is now available in mini form, without sacrificing any of its trademark tones—in fact, it offers the user three of them. Dunlop loaded the Cry Baby Mini Wah with three tonal flavors—low, vintage, and the more modern GCB95—that cover the company’s entire range of wahs and are selectable from inside the pedal. The low position gives you a throaty, resonant tone for synth-y sweeps on lower strings; on the middle “vintage” setting, the pedal's sweep is full and wide; and the GCB95 setting offers a biting upper range. There’s also true-bypass switching, a Hot Potz potentiometer and a red Fasel inductor. Power comes via a nine-volt battery or AC adapter. And despite its smaller footprint, the Mini Wah is housed in the same rugged enclosure and offers the full-sweep wah pedal feel of its older brother. A must-have. Based on the preamp stage of the Echoplex EP-3—which guitarists like Jimmy Page, Eddie Van Halen and Eric Johnson used as a booster—the EP Booster will hit your amp with up to 20dB of boost to add a rich tonal character. There’s just a single knob to dial in the level, but internal DIP switches offer options to fine-tune your boost frequencies and EQ settings, from adding more defined low end to more top-end shimmer with another 3db of boost. Whether you’re looking to add a bit of vintage dirt, richer bass or trebly bite to your tone, the EP Booster has got you covered. If you’re looking to add some Eddie Van Halen-style woosh to your tone, the Vortex Mini Flanger is for you. The three-knob pedal offers nice classic tape flange, but, like all TC mini boxes, also supports the company’s TonePrint technology, allowing the user to wirelessly beam new presets via an iOS/Android app. You can also edit your own sounds with the PC-based TonePrint Editor and USB connection. Additionally, there's true bypass, as well as Analog-Dry-Through, which maintains the full integrity of an analog dry signal path even when the flange effect is engaged. A nifty little box to add just the right amount of swirl, swoosh and shimmer to your sound.